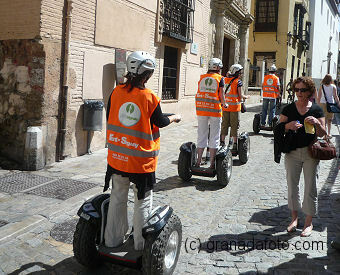 Hire a SEGWAY computer controlled two wheel transportation device and go on a guided tour of Granada. 3 or 4 routes are available. Set off from Plaza Nueva. 25€ each for a 90 minute guided tour. Users lean forward to go forward, lean back to go backward, and turn by using a handlebar, leaning it left or right. Segway PTs are driven by electric motors at up to 12.5 miles per hour (20.1 km/h). The segways were wonderful, exciting in a gentle way, a great way to see some sights. I have seen people on them on tours in other cities. Their office was next door but one to the tourist office in Plaza Nueva. We paid 25€ each for a 90 minute guided tour. I think there are 3 or 4 different routes they can take you on. We went up to Sacromonte abbey above Granada, which was too far to walk in a short amount of time. 12 years of age is the youngest they will accept although that guideline is probably more down to size. None of us had been on them before, so they are quick to master. It was a fantastic way to see some of the city. They looked after us well, I would recommend it without hesitation.